Operation Yellow Ribbon of South Jersey and The Warriors Watch Riders surprised the Voorhees native with a rock star welcome home to thank him for his service. Director of the Camden County Office of Veterans Affairs Rev. Floyd White presents Adam Knight with the Camden County Military Service Award and military service medal for his honorable service. The sound of motorcycles and police cars filled the air as they pulled into the Golden Nugget Tavern parking lot Tuesday night. The noise didn’t settle down until U.S. Army Specialist Adam Knight emerged from the front door of the bar and restaurant. Silver is a member of Operation Yellow Ribbon of South Jersey, who along with The Warriors Watch Riders gave Knight a “Mug N Hug” style welcome home. Both organizations met at Dunkin Donuts on Cross Keys Road and made their way down New Freedom Road to Golden Nugget Tavern with the American flag and local emergency personnel to surprise Knight while he was out with friends. 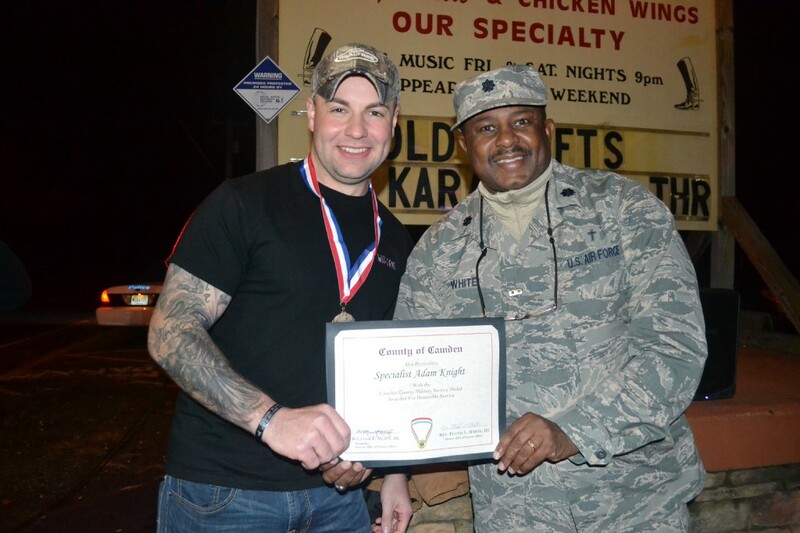 Knight, who grew up in Voorhees and is a graduate of Eastern Regional High School, recently returned home from a nine-month deployment in Afghanistan. He is based out of Fort Carson, Colorado, and is in South Jersey spending time with friends before he heads to Florida to see his family. He goes back to Colorado to report for active duty on Jan. 2. Honors he has received include the Army Good Conduct Medal and the Army Commendation Medal. 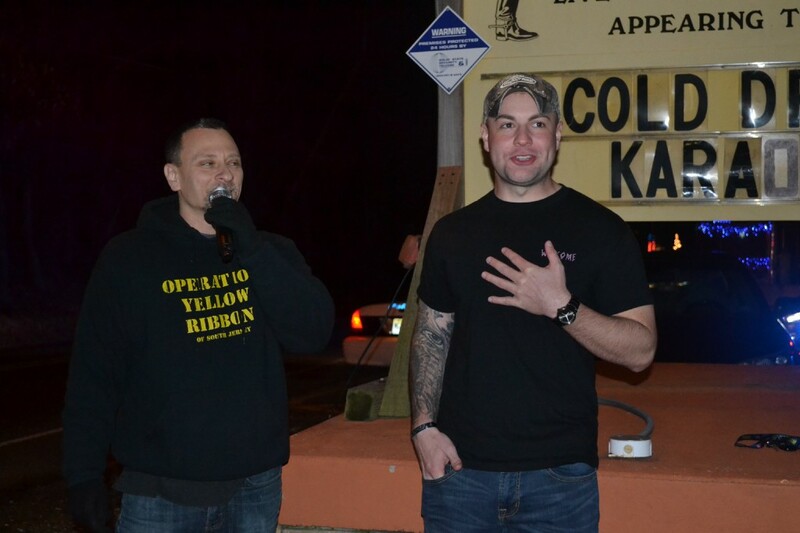 Dave Silver of Operation Yellow Ribbon of South Jersey thanks Knight for his service, sacrifices and commitment. Director of the Camden County Office of Veterans Affairs Rev. Floyd White was on hand and presented Knight with the Camden County Military Service Award and a military service medal for his honorable service. Knight also received a proclamation from Congressman Donald Norcross. Members from Operation Yellow Ribbon, who sent Knight care packages while he was deployed overseas, thanked him for his service, sacrifices and commitment. “You decided to take on the world in the form of military service for the U.S. army; that’s an unimaginably huge thing that I can’t even wrap myself around,” Terry McGinnis of Operation Yellow Ribbon said to Knight.